Traveling constantly, sampling liberally, living dramatically. 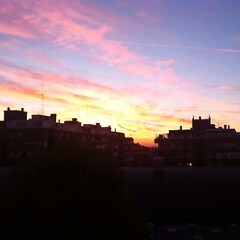 Madrid this weekend was a madhouse. The streets of the city center were clogged with impermeable human traffic jams. The metro was so packed that security guards blockaded the entrances, only allowing 50 people at a time to enter. And the narrow, weaving streets of downtown were parking lots of honking cars inching closer and closer to each others’ bumpers. 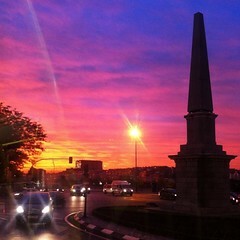 This was Madrid on Puente, aka a three-day weekend. As Friday was Spain’s Constitution Day, a national holiday, nearly the entire country (seemingly) flocked to the streets of their capital city to stand still in the middle of the sidewalk and admire the Christmas lights or ram their strollers through packed crowds over the toes of innocent bystanders. Needless to say after a day of this madness, I beelined for the first cercania train OUT of the city. 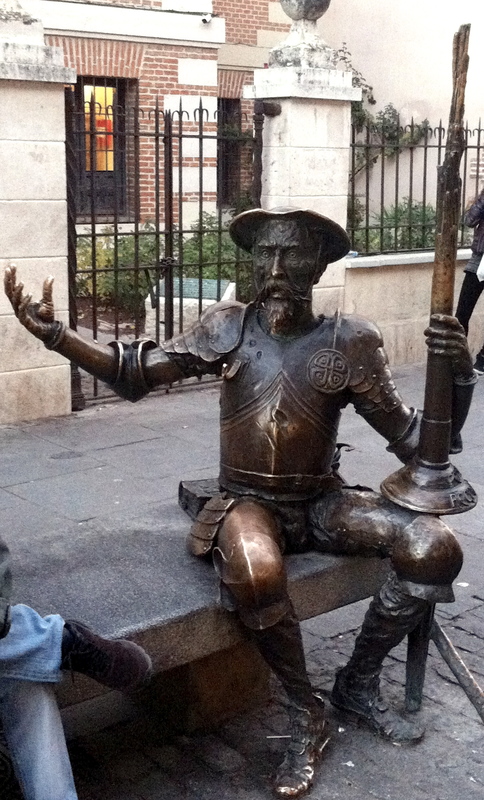 Thirty minutes later, far from the insanity of celebrating Madrileños, I disembarked into the town of Alcalá de Henares, aka the birthplace of “Don Quijote” author Miguel Cervantes. Alcalá is the second-largest city in the province of Madrid after the capital city itself, although you’d never know it by the quiet quaintness of the town center, a UNESCO World Heritage site. Walking toward the central plaza (Plaza de Cervantes), my friend and I joked that the tinsel-style Christmas trees hanging across the avenue were straight of A Christmas Story. 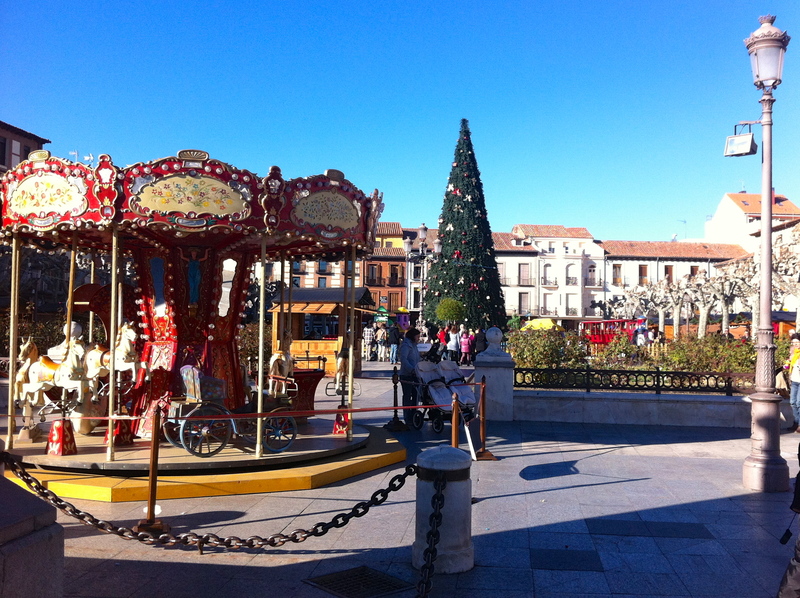 We ate our words as soon as we enter the Christmas heaven that was Plaza de Cervantes. Lining the plaza were wooden Santa’s elves’ type houses selling everything from chocolate-dipped churros to knitted slippers. A train blaring Christmas music circled a giant decorated Christmas tree (made of actual branches, not metal lights like Madrid’s tree). And lights were draped from tree to tree around the plaza. After frolicking through the plaza and admiring the Cervantes statue (in which he is perfectly brandishing his feather pen!) we headed for lunch. Alcalá is known for it’s tapas culture. 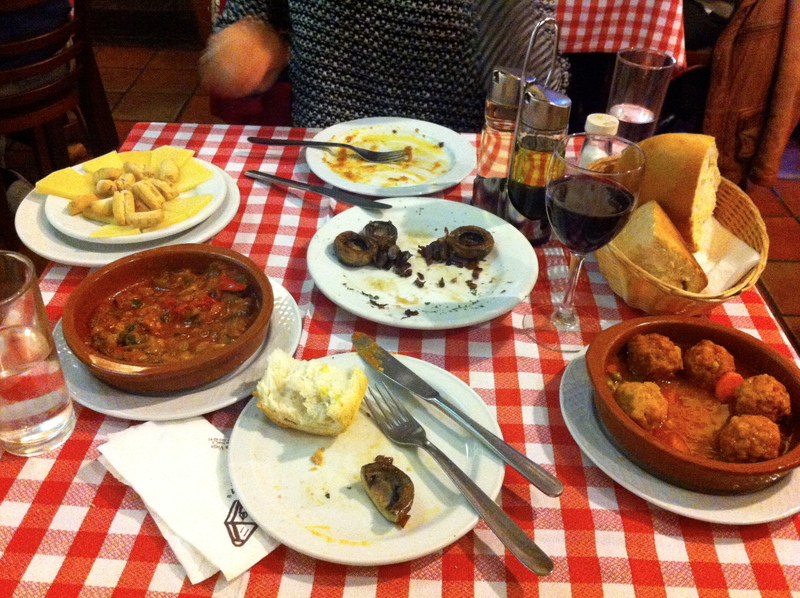 Like in Galicia and Granada, tapas bars in Alcalá give you a free small dish with every wine or beer you order. Unfortunately, when the price is free the quality is also on the low side. Not in the mood for a flurry of fried potatoes and sausage, we set off in search of a more sit-down style meal. 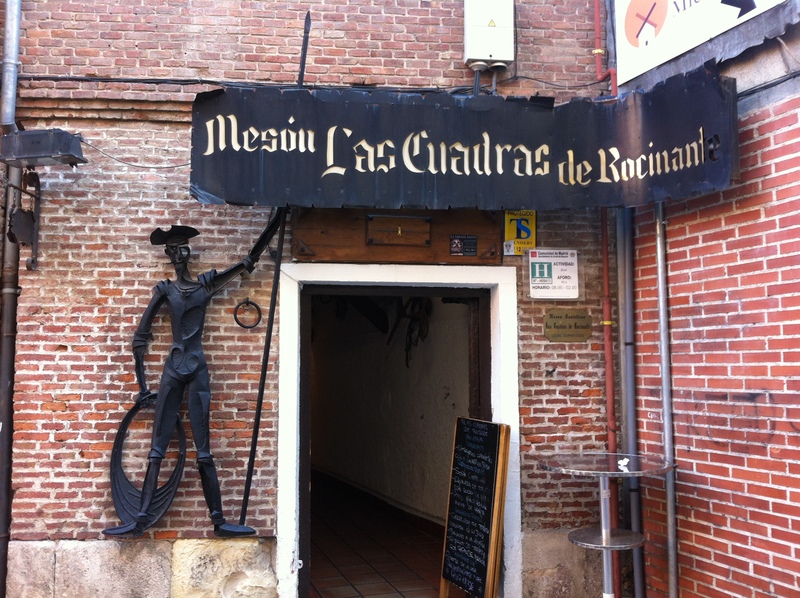 Thanks to the advise of a fantastically helpful and friendly Alcalá native, we wove back into the antique kitchen utensil decor of Mesón las Cuadras de Rocinante. Like the majority of the restaurants throughout the city, las Cuadras was absolutely packed when we arrived around 3:30 pm for lunch. Every table was taken and the bar area was shoulder-to-shoulder with people sipping a caña (and it’s free garbanzo-bean stew tapa) while they waited their place at one of the red-checkered tables. One hour, a glass of wine, and about a dozen near-disastrous collisions with the two frantic waiters later, we were finally able to claim a table. Within minutes, the bright tablecloth disappeared under cazuelas of meatballs and vegetable pisto, a basket of bread and its accompanying olive oil, a plate of seared mushrooms topped with cured jamón, and a dish of delicious semicurado cheese. It was everything I love about Spanish meals. Every item was simple, yet inexplicably packed with flavor. They were cooked to perfection, in a way that spoke to the centuries of history and practice that went into each dish. And they were presented without flourish, allowing the downright deliciousness of each plate to speak for itself. Our feast, along with two glasses of wine, set us back a mere 17 euro each. 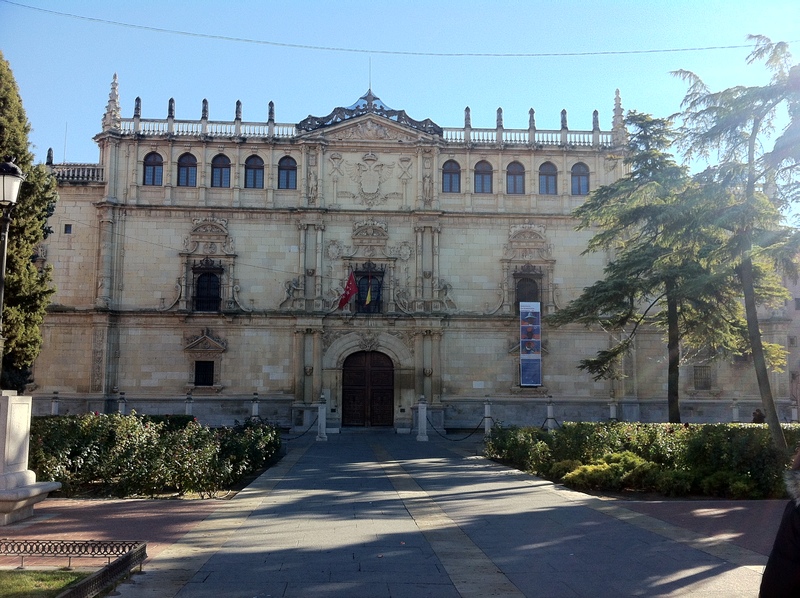 The most important part of the day completed with massive success, we set of to explore the two main sites of Alcalá: the house where Cervantes was born and the insanely beautiful Universidad de Alcalá. Unfortunately, our late lunch meant that we missed the last tour at the Cervantes house by 15 minutes (it started at 5:30pm) AND the final guided tour of the University (which started at 6pm). Guess we will just have to make another day trip to Alcalá! 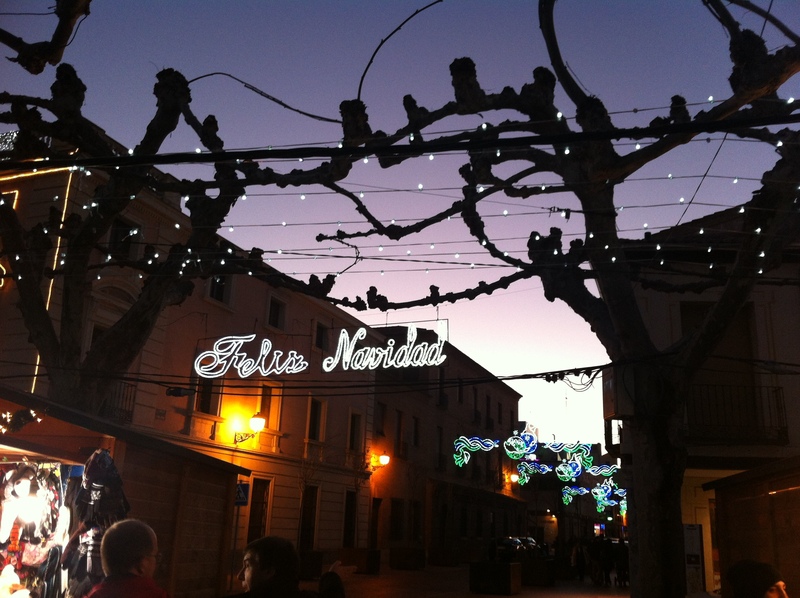 An Insider's Spain Travel Blog & Spain Food Blog! How to Eat in MADRID, SPAIN.